Clean and bright windows cleaning the blocked gutters on a residential Bath property. Hows that for clean gutters! Just keeping on top of your gutter cleaning can be arranged. 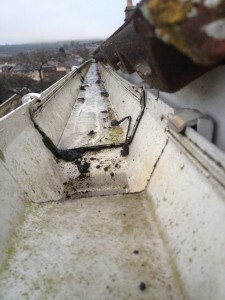 We can offer a annual gutter clean. Property sitting under tree that can give problems each year? Clean and bright gutters can help with this keeping Bath guttering Clean.